Would you prefer to pull your GCE Zen-O portable oxygen concentrator rather than carrying it around with the carrying bag? Or are you looking for an additional method to transport your Zen-O oxygen concentrator when you don’t have the energy to carry it? Whether you are walking through the airport, grocery shopping, or exercising, if you prefer to pull your GCE Zen-O then you will absolutely love the benefits of the Zen-O wheeled travel cart. Rather than being forced to solely carry your GCE Zen-O portable oxygen concentrator, GCE decided to give you, the patient the option to choose how you transport your medical device. Take your new found freedom to the next level with the addition of the Zen-O wheeled travel cart! Featuring two oversized wheels, you can conquer puddles, and curbs with ease without damaging the pristine condition of your Zen-O medical oxygen device. To enhance the overall comfort and experience, the travel cart features a telescoping handle. Allowing for multiple locking positions, you can adjust the height of the handle to your exact preference. The thought of your concentrator falling off the travel cart and becoming damaged may cross your mind when considering whether to use it or not. 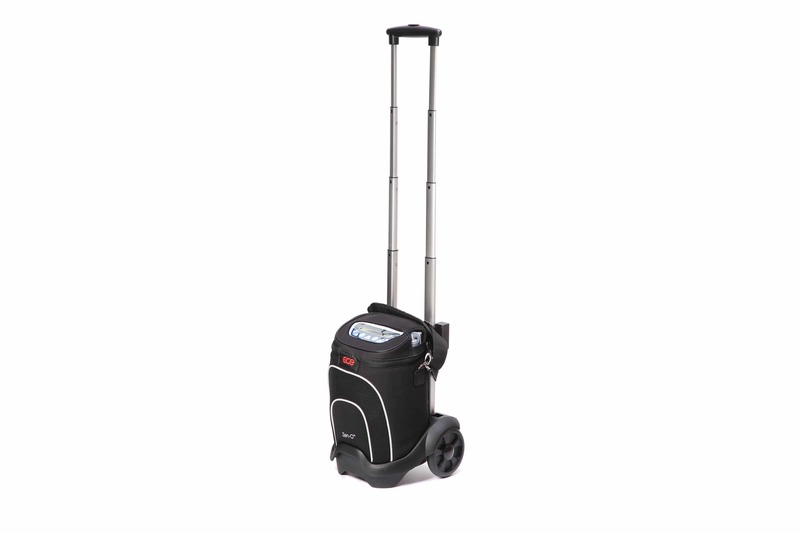 But with the GCE Zen-O travel cart you don’t have to worry about a thing thanks to the carry bag. When combined with the travel cart, the carry bag will ensure that your GCE Zen-O will stay securely on the travel cart. As the carry bag features a strap that wraps around the travel cart to keep your unit secure at all times. Not to mention the carry bag provides an extra layer of protection in the event you bump into something. This also means that you can quickly switch from pulling the unit on the travel cart, to carrying it around your shoulder with the carry bag.